A HENLEY town councillor who had surgery and radiotherapy for breast cancer has been given the all-clear. Sam Evans, 50, of Reading Road, said she felt “huge relief” after being told the good news. Ms Evans discovered a lump in her right breast in August and went to see her GP Dr Clare Alsop at the Hart Surgery. Two weeks later she had a mammogram at the Royal Berkshire Hospital in Reading which showed the growth was about the size of a golf ball. A biopsy found that she had lobular cancer, a type that begins in the milk-producing glands of the breast. She underwent a lumpectomy, a surgical procedure to remove the growth and a small amount of the surrounding tissue, and in November she had more surgery to reconstruct part of her breast. In January and February she had 15 sessions of radiotherapy treatment in three weeks. Soon afterwards, she was given the all-clear. Ms Evans said: “I never believed I was going to have anything other than that result. If I’d let myself go down the route of thinking anything other than the best outcome, I’m not sure how I would have coped. It’s the way my brain computes — I had to believe the best. “Obviously, I felt huge, huge relief but in way it was like a lodger had moved out. Ms Evans said that after talking publicly about her condition for the first time to the Henley Standard in December five people had told her they had taken her advice to get checked. “All five have had that check and not one of them had cancer,” she said. “One friend told me that she had been worrying for three months and she hadn’t even told her husband because she didn’t want the bad news. “As soon as she read the article she made an appointment and it turned out to be a benign cyst and it has been removed. If this means five more people go to the doctor then that’s great and if 10 people go that’s even better. “Not everyone is going to get good news but when you do it’s a relief. “I firmly believe that good always comes out of bad and I think so much good has come out of this — primarily, people going to get checked. “Secondly, I’ve had more love and support thrown at me over the last six or seven months than I could ever have imagined. Ms Evans described her radiotherapy treatment at the Royal Berkshire Hospital in Reading as “slightly weird”. “You go in every day and you see the same people in the waiting room and we all smile at each other because you know why you’re there,” she said. “It’s so precise how they line you up with the machine so they zap you in the same place every day. “The staff at the Royal Berks are absolutely lovely. They explain it and they do everything they possibly can to make you feel comfortable in what is an uncomfortable situation. “I felt pretty much fine for the first week but then it picked up. Fabulous friends drove me to the hospital pretty much every day. “Sitting in waiting rooms is not the nicest place to be so I had lots of catch-ups with friends. “I was confident it was the last stage of the treatment. I had a positive feeling that every day was getting closer to that last day. “I had the option of this or chemotherapy. I preferred radiotherapy to a load of poisons being pumped into me. Ms Evans will have hormone treatment for the next five years, which involves taking a pill daily to increase her chances of staying cancer-free. She will also have a mammogram once a year. 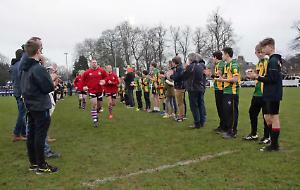 She plans to hold a celebration lunch with friends and those who supported her at the Henley Hawks’ last home game of the season at Dry Leas on April 29. Ms Evans returned to her duties as a town councillor last month having been signed off since September. She is a member of the ruling Conservative group and chairwoman of the council’s recreation and amenities committee. She said: “The side of the council I loathe is all the negativity. In some cases there’s a greater need to score points over other councillors than to find the best solution for a problem and that is wrong. “We’re not Westminster, we’re a parish council and let’s focus on Henley rather than getting one over on somebody else. Ms Evans is also concentrating on her luxury concierge business Humphreys of Henley and has returned to the No Limits gym for the first time since before her surgery. She said: “Not going to the gym was one of the things that showed me the cancer had taken control as it was stopping me doing my normal stuff.